Any teacher or staff member in the school can create a group following the steps below. Group types include Curriculum and Standard. Curriculum groups have special tools for the creation and publication of curricular content. All other uses of groups should use the standard type. All groups include a calendar, locker, news and discussions. Curriculum groups make it easy to create and share units, lessons and assignments. Teachers can copy these documents into their courses. Groups may be private or district-wide. 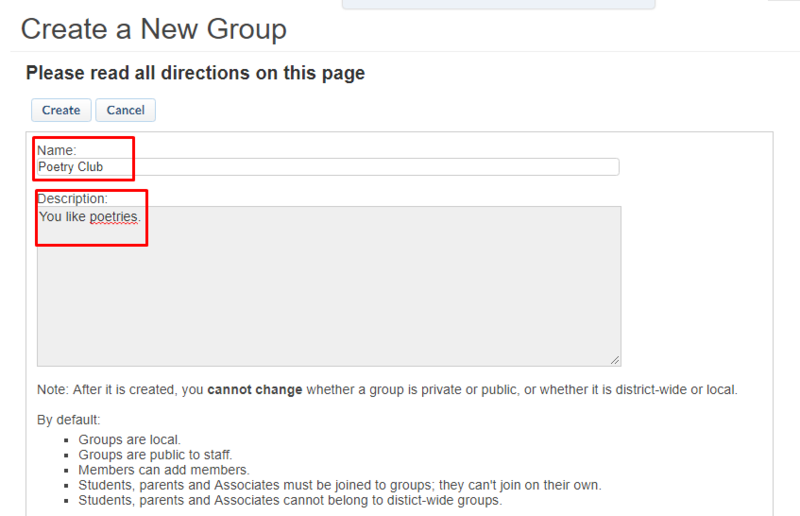 At the top right corner of your portal, choose Groups > Join/Create Groups. Click the Create Group button on the next page. Enter the name and description for the group. In the District-wide and Private Groups section, choose Private Group for a limited audience. Otherwise, it is set to District-wide by default. This option cannot be changed after the group has been created. In the Group Type section, choose either Standard Group or Curriculum Group. This option may be changed after the group has been created. The created group (e.g. Poetry Club) will be included in the list of available groups.